MOZART: Sinfonia Concertante for Violin, Viola and Orchestra in E-flat major, KV364; Adagio in E; Rondo in C (Minus Violin version). Composed by Wolfgang Amadeus Mozart (1756-1791). For violin. Sheet music and 2 CD set. 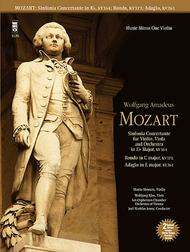 Published by Music Minus One (MO.MMOCD3170).ISBN 1596157801.In late 1779, Mozart penned this delectable classic, which stands as the only remaining Mozart composition in this form, incorporating both symphonic and concerto styles. It features wonderful parts for both of the solo instruments against Mozart's incomparably brilliant writing and orchestration. We have also included two wonderful Mozart bon-bons, the E-major Adagio, KV364; and the C-major Rondo, KV373. A magical and exciting experience to perform this alongside virtuoso Jurgen Klos at the viola and Les Orphelstes Chamber Orchestra under the baton of Joel Mathias Jenny. A classic not to be missed by any violinist! Includes slow-tempo practice accompaniments of the aster auter movements.